Napoli goalkeeper David Osina receives treatment after collapsing on the pitch against Udinese. 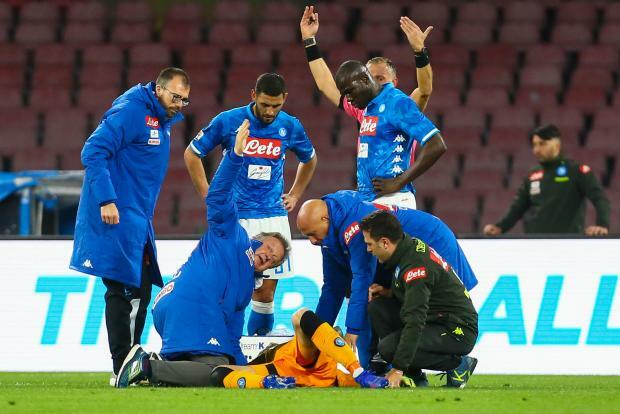 Napoli goalkeeper David Ospina was taken to hospital on Sunday after collapsing unconscious on the pitch following a knock to the head earlier in a Serie A game against Udinese. The Colombia international received treatment after colliding with striker Ignacio Pussetto ten minutes into the game at the Stadio San Paolo. The 30-year-old, who is on loan from Arsenal, was treated on the pitch and returned to play with bandages around his head. But after 41 minutes later, Ospina collapsed to the ground as medics rushed onto the pitch, with the player stretchered off and transferred to hospital in an ambulance for tests.